I couldn’t be happier with the way this design turned out. In a certain sense, I’ve wanted this t-shirt since I was about four years old. Kevin will be sharing in the profits from the sales of this shirt. Second: I’m now partnering with Oddica — a wonderful purveyor of shirts and other apparel — for the printing and shipping of Daring Fireball t-shirts. You still order and pay for your shirts here on Daring Fireball, and you still get a one-year membership with each order (or a one-year extension to an existing membership), but then the order immediately gets passed on to my friends at Oddica for fulfillment and shipping. This should take a process that previously took weeks — and in some cases, due to my own mistakes and poor inventory management, months — and turn it into a process that takes just a few days to get new shirts into your hands. The bottom line: Higher-quality shirts and much faster fulfillment times. There are two shirts for sale: the new “Daredevil Helmet” design, and the classic DF logo shirt. Starting today, both shirts are handled by Oddica, and will be printed on American Apparel 100 percent cotton shirts. Both shirts are entering production this week, and they’ll begin shipping in mid-April. And, of course, everyone who orders a shirt by April 16 is eligible for the 2007 membership contest, chock-a-block with swell prizes. There are dozens of pending shipments for shirts ordered during the last few months, and, at the moment, I have an embarrassingly large queue of support email regarding delayed and lost orders. All pending shipments (and re-shipments for lost packages) will ship before new orders begin shipping in mid-April. Most pending orders will ship from my existing stock of shirts. Expect this site to be relatively quiet for the next day or two as I work through these piles. 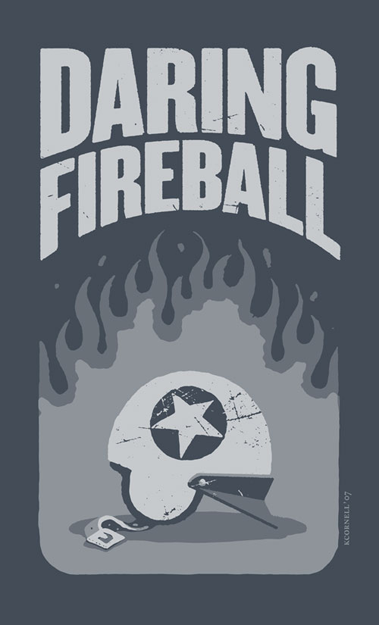 My thanks to everyone for their support of Daring Fireball, and for the patience of those of you who’ve had to wait far longer than is reasonable for your shirts to arrive.